With Flux, Becky has portrayed a semi-feral seventeen-year-old in Dog Act by Liz Duffy Adams and a lovesick crimefighter in Hearts Like Fists by Adam Szymkowicz. Both productions have earned her NYIT nominations: Outstanding Featured Actress for Dog Act and Outstanding Lead Actress for Hearts Like Fists. Additionally, she has participated in various Have Another’s and in the Food: Soul of Liz Duffy Adams’ Wet, or Isabella the Pirate Queen Reaches the Horse Latitudes. 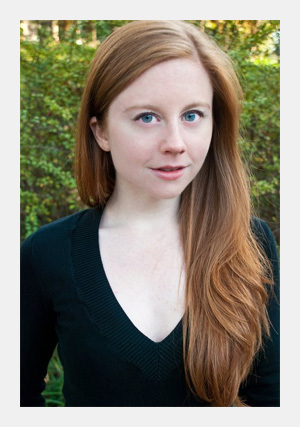 Outside of Flux, Becky has appeared in various Regional, Off-Broadway, and Off-Off-Broadway shows. Recent productions include: The Contemporary American Theatre Festival’s A Discourse on the Wonders of the Invisible World (Rebekkah); Vampire Cowboys’ Geek! (Honey); Gideon Productions’ Advance Man (NYIT award winner for Outstanding Production of a Play) and Blast Radius (Ronnie); Retro Productions’ The Runner Stumbles (Louise) co-produced with The Bleecker Company, A Day in the Death of Joe Egg (Joe), and Dear Ruth (Miriam); and Piper McKenzie’s Craven Monkey and the Mountain of Fury (Air Minion/Monkey) and Willy Nilly (Cass/Choreographer—NYC Fringe). She has also participated in various readings at Playwright’s Horizons, Women’s Project, the Lark, Samuel French, HB Studios, and New York Comic Con. Film productions include: Derelict Films’ Play Hooky and Play Hooky II (Megan), Guy In His Basement Productions’ Go Scratch (Kelly) and The Caddywhompus Years (Melody), The Electric Mess’ She Has a Funny Walk. Becky is honored to be a 2010 NYTheatre.com Person of the Year. Check her out at beckybyers.net!